The King Air C90 12-seater aircraft had taken off from the Juhu airstrip on a test flight. 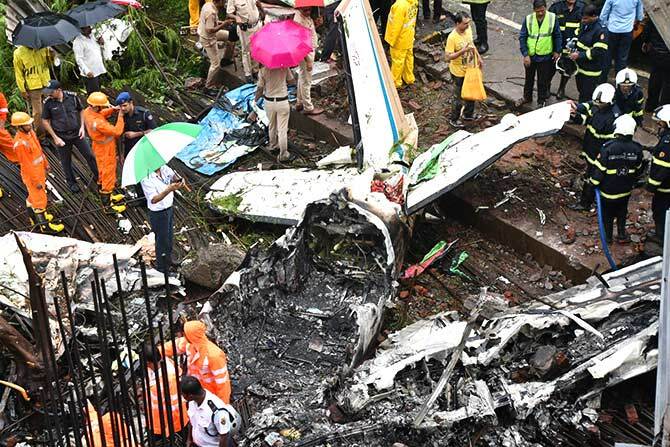 A 12-seater aircraft crashed in to Mumbai’s suburb of Ghatkopar on Thursday, killing both the pilots and two aircraft maintenance engineers on board, besides a pedestrian, the police said. This was the second air mishap in Maharashtra in two days. The pilot and flight test engineer of a Sukhoi Su-30M aircraft of Hindustan Aeronautics Limited had ejected safely after it crashed near Nashik on Wednesday. 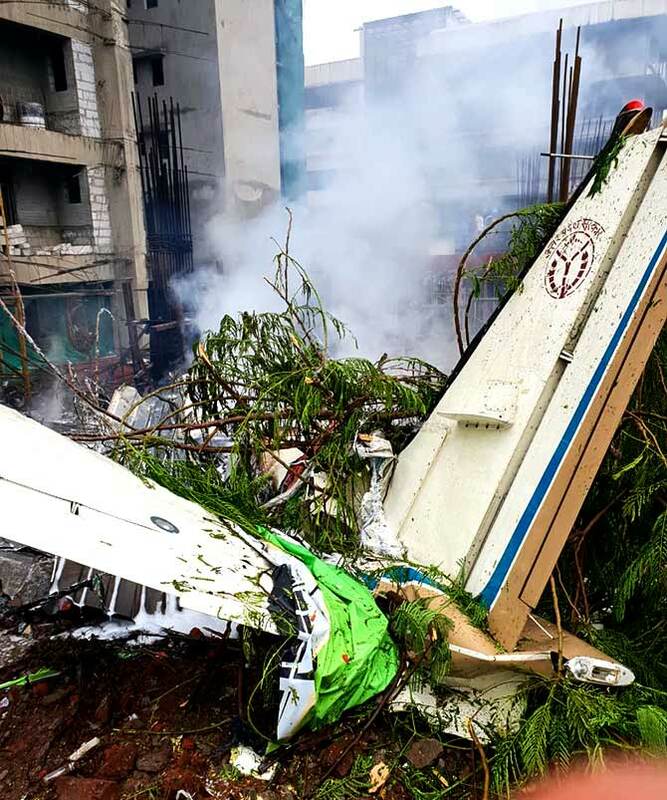 The King Air C90 plane, which crashed at the Old Malik Estate near Ghatkopar telephone exchange on Thursday, once belonged to the Uttar Pradesh government and was sold to UY Aviation, an official said. The aircraft had taken off from the Juhu airstrip on a test flight. It lost control when it was four nautical miles from Juhu, Air Traffic Control sources said. Civil Aviation Minister Suresh Prabhu has asked the Directorate General of Civil Aviation to conduct an investigation into the plane crash. “The aircraft took off from Juhu airport for a test flight. There were two pilots and two aircraft maintenance engineers on board. All of them, along with one person on the ground, are dead,” a DGCA official said. 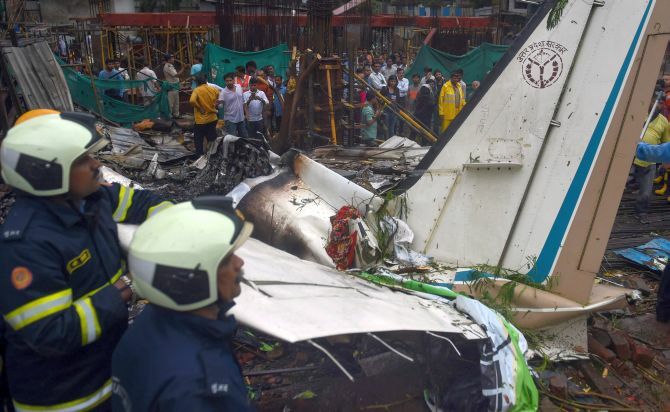 The police identified the crash victims as pilots Maria Zuberi, 48, and Pradeep Rajput, engineer Surabhi Brijeshkumar Gupta, 34, technician Manish Tejpal Pande, 21 and pedestrian Govind Pandit. A team of DGCA officials rushed to the crash site for a preliminary investigation. 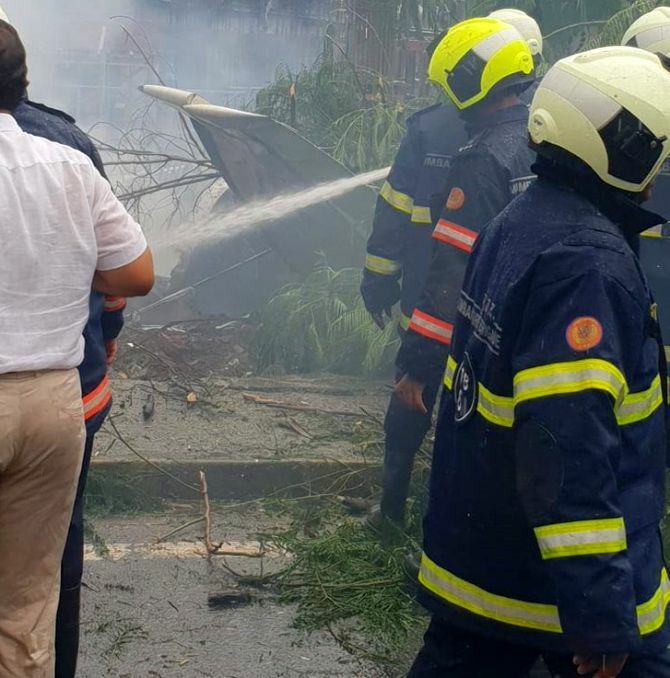 A two-member team of the Aircraft Accident Investigation Bureau, which comes under the civil aviation ministry, too reached the city to probe the crash. 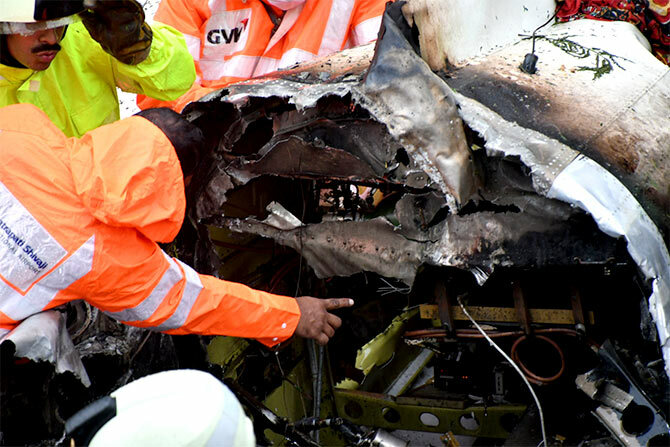 DGCA officials traced the Aircraft Voice Data Recorder (black box), which will help them piece together the events that led to the crash, an official said. “The aircraft was from Juhu-to-Juhu cross country flight and took off at 12.20 pm. It was coming in for landing at Juhu when it crashed at 1.11 pm,” an AAI official said. The control tower tried to contact the pilot when the aircraft took off but was unable to do so, the official said, adding probably a technical snag developed in the aircraft due to which the pilot could not control the plane. “It also appears that the pilot tried to land the aircraft somewhere on the road,” he said. Investigators are likely to collect the wreckage of the plane in the next two days, he said. Meanwhile, a DGCA official denied engine failure as possible reason behind the crash. “Had there been an engine failure, the pilot would have sent distress signals to the control tower. In our initial probe, no such signal has been traced,” he said, when asked if engine failure could be the reason behind the crash. He, however, rued the coming up of high-rise buildings in the vicinity of the airport, posing various threats to flight safety. “It is quite shocking to find clusters of high-rise towers so close to the airport here, which ordinarily never happens elsewhere,” he said, requesting anonymity. 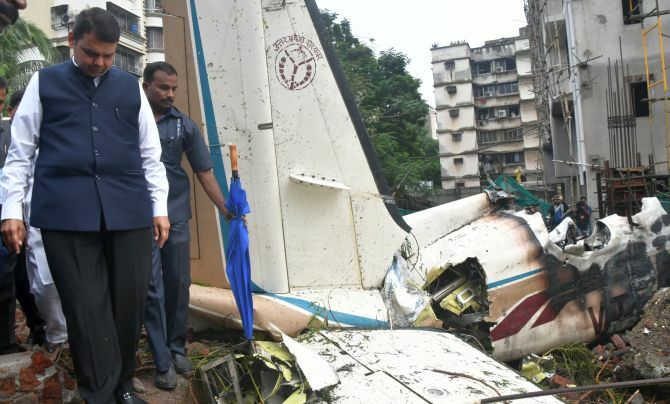 Maharashtra Chief Minister Devendra Fadnavis too visited the crash site and said the air mishap would be probed. “Today’s incident is very unfortunate and worrisome. Had this incident happened at a crowded place instead of a secluded site it would have been more disastrous,” the CM told reporters. Fadnavis said the cause behind the crash would be known after probe. “The reasons behind the mishap and names of those responsible for it should come out in open. Civil aviation minister has already ordered a probe into the incident. We had requested him (to order a probe) considering the gravity of this unprecedented incident,” he said. He said the compensation will be awarded to the victims of the crash as per norms. 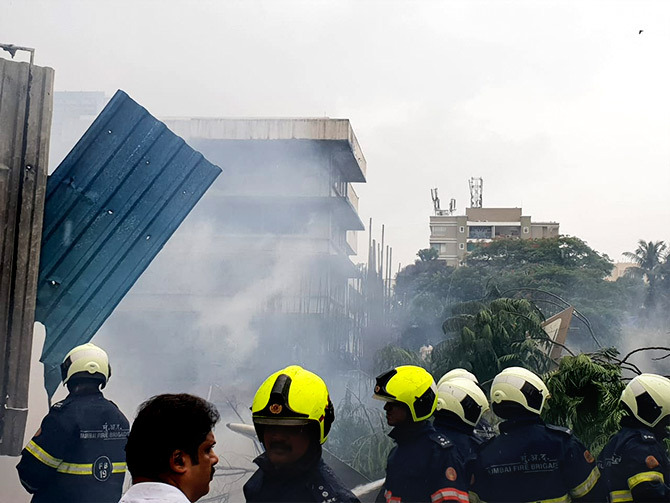 Bharatiya Janata Party MP Kirit Somaiya said he spoke Prabhu to review the guidelines for repaired aircraft test run on the densely residential zone. “The minister has agreed to check this,” he said. Former Civil Aviation Minister Praful Patel praised the pilot for averting large-scale loss of lives. “Salute to the pilot who showed presence of mind to avoid a big mishap, saving many lives at the cost of her own life,” the Nationalist Congress Party leader tweeted. Uttar Pradesh Civil Aviation Minister Nand Gopal Gupta said the plane which crashed today was an Uttar Pradesh government aircraft till 2014 and was sold to UY Aviation Pvt Ltd of Mumbai that year. “We extend our heartfelt condolence to families of the people who lost their lives in the crash,” he said. 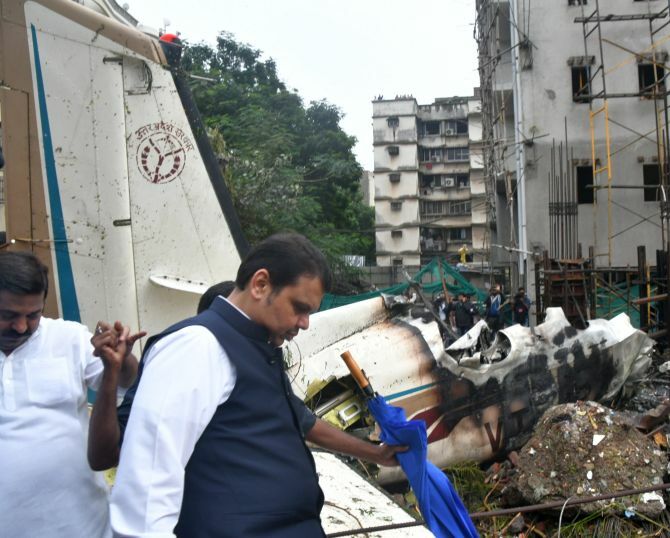 Maharashtra has witnessed three fatal air crashes since the start of this year, in which a total of 14 lives were lost. 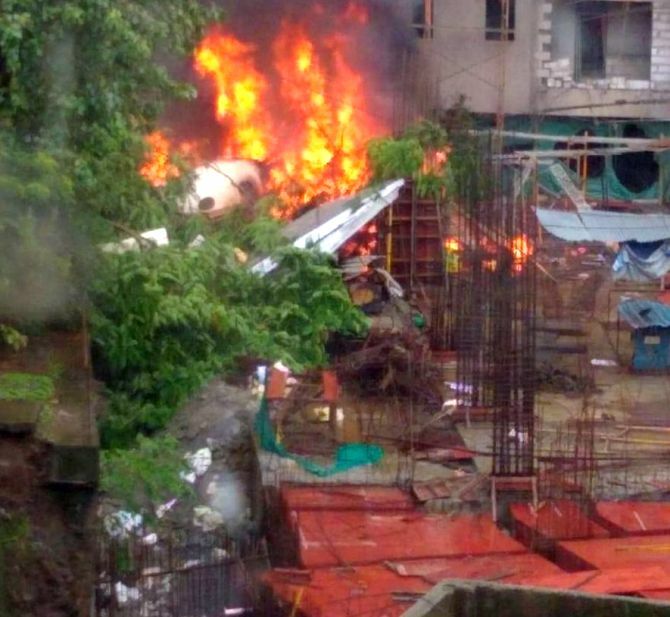 Five persons, including four who were on-board, were killed when a 12-seater aircraft crashed in suburban Ghatkopar of Mumbai on Thursday afternoon. On January 13, a Pawan Hans helicopter with seven people on-board crashed off the Mumbai coast minutes after it took off for ONGC’s oil installation in the Arabian Sea. The French-made chopper Dauphin N3, bearing registration number VT-PWA, was scheduled to land at the oil rig at Mumbai High but went missing after taking off from the Juhu aerodrome. Of the seven people killed, five were ONGC officers and the remaining two pilots. On April 26, an aircraft from the National Flying Training Institute crashed in the Wainganga river near Deori in Tiroda tehsil of Gondia district, eastern Maharashtra, killing two persons on board. The twin-engine plane DA42 took off around 9.25 am from Birsi but soon dropped altitude and crashed into a cable-car ropeway nearly 20 minutes later over the Wainganga river.